Its been a minute since I last posted- I apologize for the disconnect. I just moved my apartment and well we all know what it’s like to uproot your home and relocate it. Especially when you been in the spot for 8 years. My landlord raised the rent $600 in my Sunnyside, Queens neighborhood and thats when I realized- she’s nuts and I had to go! GREEDY SLUMLORDS- New York is filled with them. The positive thing is I got a dope new spot in LIC/ Astoria border right by the water and parks and in a community that I have done a lot of work in- Welling Court. My new landlord is a community organizer and activist and I can actually chill with him, what a relief!!!! So with that I think my move is a positive one and I am truly looking forward to building more with my new community. I am also excited for my long walks to the park and bike rides along the water to come!!!! On a biz note- I have 3 shows coming up. The first is a show with @MightyTanaka who has been repping me for the past year or so- I enjoy working with Alex, he is good people. It’s important for me to work with honest people who are truly making things happen in our community and contributing to the support of artists who need it…. 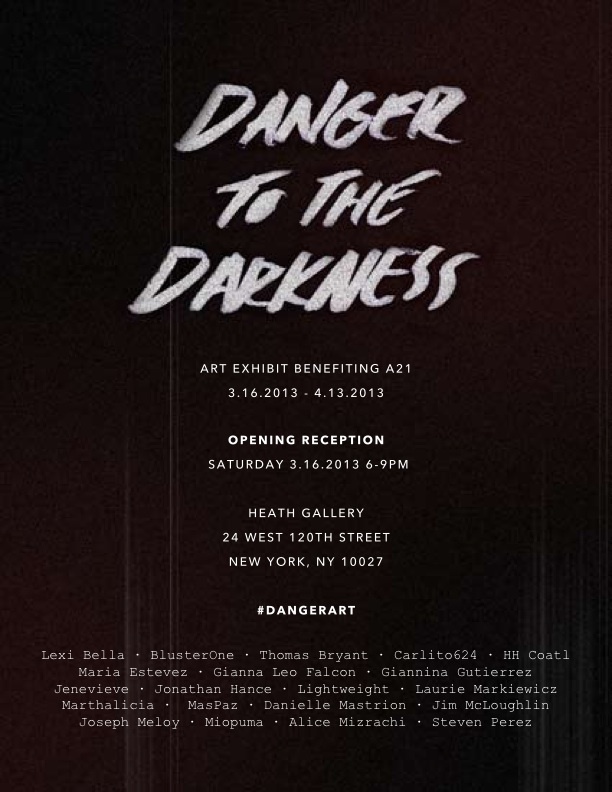 Harlem, NY – Heath Gallery is proud to present “Danger to the Darkness”, a group art exhibition and fundraiser in support of The A21 Campaign, an organization committed to abolishing slavery and human trafficking in the 21st century.As passionately expressed by co-founder Christine Caine, the tragedy of kidnapping and sexual exploitation is a very real, prominent evil that can be prevented and eliminated through education, awareness, and action. Enter: Heath Gallery, with a fresh army of art activists. “Danger to the Darkness” enlists creative minds from all disciplines to share glimpses of those powers that shine light into the dimmest corners of our collective existence.The walls of the landmark Harlem brownstone will be lined with thoughtfully assembled, personal images of redemption and triumph, and whose manifestations are fundamental testaments to the fortitude and resilience of the human spirit. The Heath Gallery family invites you to join in contemplation and support of an urgent cause – one that can often seem worlds away. and the final exhibit is on March 14th from 7-11pm. 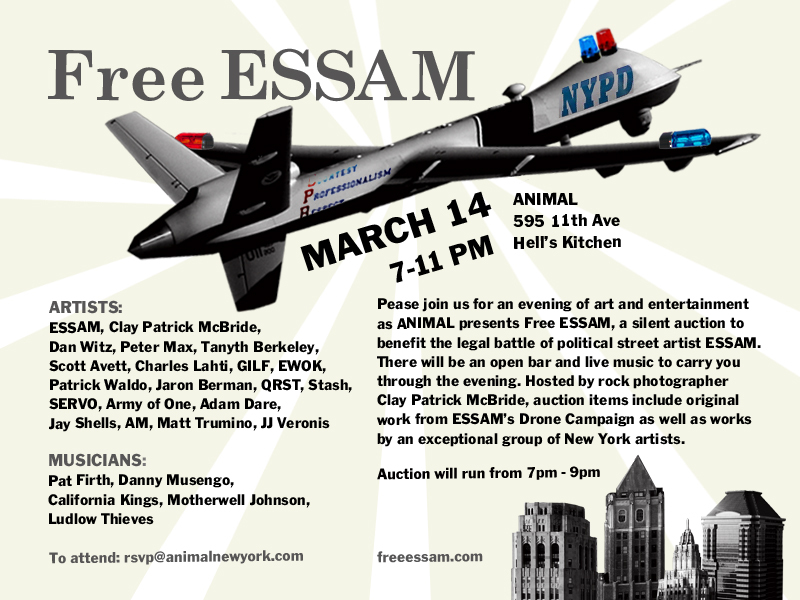 Please come through to support this artist who has been incriminated for posting posters around NYC about drones. Great chance to support artists and get some good art for reasonable prices. I’ll also keep you posted about my upcoming projects for Spring- Sing For Hope Pianos, Mural in Bushwick 5 pointz and collaborations with some AMAZING women!! !